NEW YORK — The new owner of realtor.com operator Move Inc. kicked the tires of its two chief competitors, Zillow and Trulia, before acquiring Move for $950 million in November, News Corp. CEO Robert Thomson revealed today. 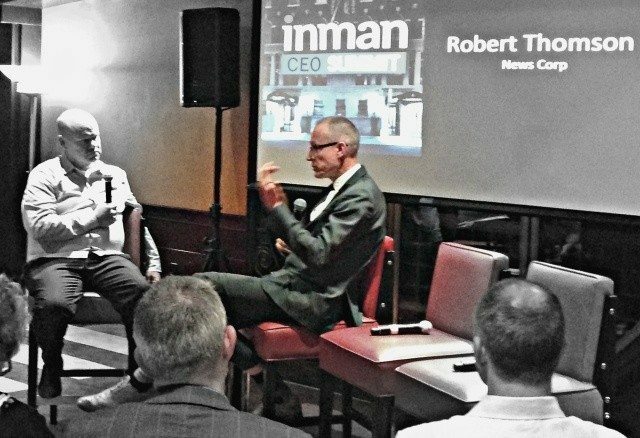 In a one-on-one conversation with Inman Publisher Brad Inman at Real Estate Connect New York City, Thomson said News Corp. has big plans for its U.S. real estate play. For one, it will focus on driving consumers who are serious about buying or selling a home to realtor.com. “Leadless traffic is like a loveless marriage,” Thomson said, driving home the point to an intimate group of real estate execs attending the “CEO Summit” — and delivering a dig at rivals Zillow and Trulia, which both get more traffic than realtor.com, in the process. News Corp. CEO Robert Thomson, right, discusses the company’s plans for realtor.com with Inman Publisher Brad Inman. The relative freshness and accuracy of realtor.com’s listings, courtesy of Move’s agreement with the National Association of Realtors to operate the site, helped solidify News Corp.’s decision to pursue the deal, he said. In his long career running ad-supported websites, Thomson said he has learned that just having data is not enough. There has to be relevant content behind it. So News Corp. plans to beef up realtor.com’s editorial content. Just a week after closing the Move acquisition, News Corp. began integrating content from The Wall Street Journal and other News Corp. media companies with realtor.com. In addition to tapping other News Corp. media companies, Move will produce its own content in-house, with a new editorial team. Homebuyers are a discerning group, Thomson said. High-quality journalism — something News Corp. knows how to produce — will engage realtor.com’s audience and sharpen Move’s focus on increasing its agent advertisers’ return on investment. Execs at Zillow and Trulia are focused on agent ROI as a key operating metric, too. Even as they’ve been working to shore up the accuracy of their listings, the portals have been building out content around their listings that engages users — Trulia’s data on crime and local amenities, for example, and agent profiles on Zillow. Thomson said News Corp. is also looking at how to monetize different aspects of realtor.com’s traffic. For example, it can segment out certain users based on their search history on the site, and monetize that insight in ways that realtor.com hasn’t done up to this point. News Corp.’s deep experience running media companies will come in handy when analyzing new ways to utilize the traffic realtor.com gets, Thomson said. Thomson also addressed some perceptions about Move’s future, given that News Corp. is a majority owner in REA Group Limited, operator of the popular Australian real estate portal, realestate.com.au. The Australian site generates most of its revenue off of fees it charges brokers and agents to list their properties. As part of the News Corp. acquisition of Move, REA Group also owns a 20 percent stake in Move. Thomson said that realestate.com.au’s model evolved, in part, in response to Australia’s concentrated urban density and expects that America’s broad geography will support a different model. At the same time, he said, the U.S. is in the early stages of a digital real estate revolution that’s upending business as usual, implying a conclusion is hard to draw right now on just how the portal side of American residential real estate will mature. Move will have just one major competitor if Zillow completes its planned acquisition of Trulia. If Wall Street rumors are true, the Federal Trade Commission won’t block the deal or impose deal-breaking conditions on it. Zillow’s long-standing agreement to receive listings from syndication platform ListHub, a Move subsidiary, is set to expire in early April. Zillow executives announced on Jan. 6 that they could not accept the terms proposed by ListHub to renew the agreement, and that it would be allowed to expire on April 7. Zillow announced a new initiative to obtain direct listing feeds from multiple listing services and brokers the same day. Regardless of the outcome of this first skirmish between News Corp. and Zillow, Thomson made it clear that he intends for realtor.com to be a formidable competitor, and that he has more leeway from NAR to operate the site as he sees fit than Move had before the acquisition. “If Move doesn’t (compete) now, it’s not NAR’s fault, it’s ours,” Thomson said.